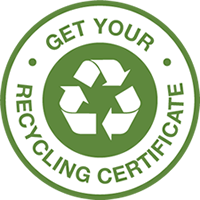 Heritage LifeCycle in partnership with Curie Environmental Services, LLC (Curie) is providing recycling for radioactive materials in North America (48 contiguous states). Curie, was the first in the nation to provide a mail back program-CuriePack sm for ionizing smoke alarms. Curie offers mail back programs for other recyclable radioactive material which is unique in the industry. These kits include a mail back kit called SourcePack sm to facilitate uranium/thorium chemical compound recycling, as well as, mail back kits for the recycling of tritium exit signs, lead aprons and lead shielding. Custom mail back kits for sealed sources are available upon request. Curie maintains a specific radioactive materials license (RS500-01) issued by the State of New Mexico Environment Department Radiation Control Bureau. This license was specifically crafted to enable a wide range of radioactive materials that may be accepted at the Curie facility. All Curie kits are non- refundable unless the customer receives an incorrect or damaged item. The customer needs to notify Heritage within seven (7) business days. A forty percent (40%) re-stocking fee will apply to items that are unused and damage free.